National nonprofit organization KaBOOM! helps an Indianapolis community construct a playground in just one day. An empty lot, one lone rickety slide; there are plenty of places that don’t beckon children to play. But KaBOOM! 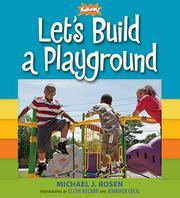 gives kids the chance to create their dream playground. A swing might be a trapeze, high above the crowd. A slide could be a giant dinosaur. And what about adding a merry-go-round? Or a sand castle big enough to hide inside? Or a hot tub?! Making a new playground starts with ideas—kids don’t just list playground equipment, they let their imaginations run wild. Rosen then carefully follows the weeks of planning from fundraising to mulch delivery, even explaining the molten metal used to create the monkey bars. When the one-day build finally arrives, 214 volunteers gather to help. There is a huge sense of accomplishment and communal pride: The playground really does belong to every single person who played a part. Whispered asides to readers, including definitions and measurement explanations, are found in colorful sidebars, and full-page photographs show construction vehicles alongside the absolute glee found on children’s faces.